Amazon is discounting the 8" 32GB version of the Tab S2 in all its colors: the gold and white versions go for $247.99 but the better deal is on the black one which is going for a little less at $239.99 - you'll need to add it to your cart though to see the price. You'll find a rather similar $247.99-$249.99 price on Best Buy and B&H. 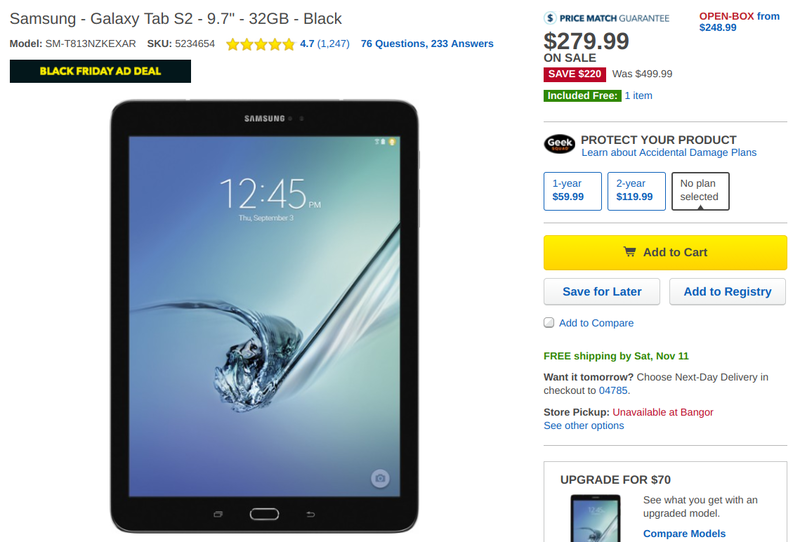 But that's not the only Tab S2 deal you can find. The 9.7" version of the tablet, which obviously has a larger display, is also discounted. In this case, only the black color is seeing the significant price drop and all of the retailers have the same price: $279.99. You can find it on Amazon (add it to your cart to see the price), B&H, and Best Buy. Black Friday seems to be Black November this year, with deals starting way too early. All the better for us as consumers, all the worse for our wallets. And consider yourself warned about the deluge of "deal alerts" on Android Police. It's only gonna get worse.